Jawaharpur – In one fell swoop, LOESCHE has sold 32 coal mills to India and gained a new end customer in the process. The large vertical roller mills (VRM), with two rollers each and a performance of 79.2 t/h or 75.6 t/h, will be used in the coal-fired power plants "Super Thermal Power Station" in Jawaharpur and "Obra-C" in the Sonebhadra district of Uttar Pradesh state in North India. At both locations, the end customer Uttar Pradesh Rajya Vidyut Utpadan Nigam Limited (UPRVUNL) will operate four power station blocks from 2020/21 onwards, with 660 MW of power each. Delivery of the LOESCHE mills should be made by Autumn 2019 and will include electric drives, slide gates, instrumentation and junction boxes. The contractor and constructor for the power plants is the Indian company Doosan Power Systems India (DPSI). DPSI, a subsidiary of the Korean Doosan Heavy Industries Group, was commissioned by the state electricity supply company of Uttar Pradesh, to the value of 2.3 billion US dollars. With its efficient VRM technology and competitive prices, LOESCHE was able to assert itself among international competitors and once again win over its long-standing partner in joint projects. It is worth noting that this is the first large order obtained by the LOESCHE subsidiary Energy Systems India Private Ltd (LESI) in the Indian power plant market. LESI has its head office in Chennai – in direct proximity to Doosan Power Systems ndia (DPSI). LOESCHE recently established LESI in India with a connected workshop, in order to strengthen and expand its market activities in the thriving subcontinental energy sector. The Indian energy market is the second largest in the world, after China. Energy production in India is currently primarily dependent on coal power plants. Experts predict an average increase of 18 GW per year until 2020 in coal power plant output. For this reason, the construction of a large number of coal-fired power plants is planned. With its new subsidiary, LOESCHE can better provide the local energy sector with LOESCHE mills and maintenance services in future. The 32 coal mills for the new UPRVUNL power plant are distinguished by their modular construction, which has been tried and tested by LOESCHE in the cement industry. The principle of these grinding plants is based on a horizontal grinding table with segmented grinding plates and conical rollers (M) which are arranged at a 15° angle to the grinding table. The hydraulic swinging device for the rollers (M) ensures a simple and fast change of grinding parts. 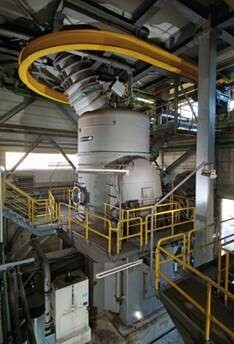 LOESCHE mills guarantee consistent throughput and fineness product quality using an efficient hydraulics system to regulate grinding pressure, and a speedcontrolled grinding table and high efficiency classifiers.